Summer is a time for fun and sunshine. Unfortunately, this wonderful season often includes bites and stings from various bugs and insects. 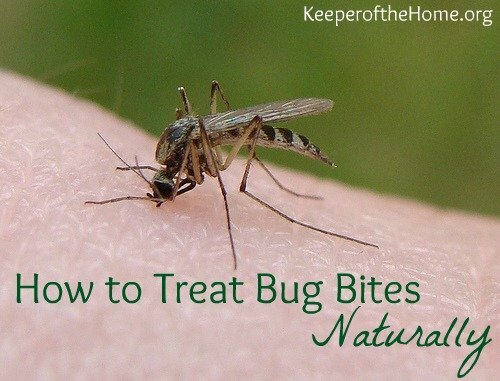 The easiest way to deal with bug bites is not to get them in the first place! Most commercial insect repellants contain DEET, which is a very strong chemical I don’t care to put on my skin or the skin of my sweet babies. Thankfully, there are natural alternatives that actually work. To ward off bugs and insects, try using a homemade bug spray. You might be surprised at how simple it is to prepare insect repellent! All it involves is stirring a few ingredients together. Before going on a camping trip, try increasing your consumption of vitamin B1 for a week or two. It is thought that the thiamin in vitamin B1 produces a body odor, undetectable to humans, that repels biting bugs, especially mosquitoes. Plantain is a well-known remedy for bug bites and has been used by herbalists for many years. The great thing about plantain is that it is a common lawn weed and can therefore be found in many areas. 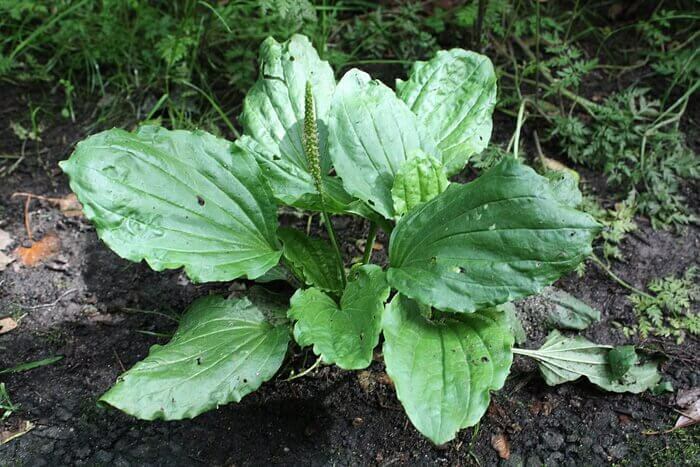 Have you seen Plantain growing around your neighborhood? If not, it would be a good thing to plant in your own garden. To treat bites immediately, fresh plantain can be chewed (to break down the plant), then held over the affected area for relief. Yes, it’s gross, but it works! Keep the plantain in place by taping with a band-aid or wrapping with gauze or a bandage. Plantain has the ability to inhibit and reduce swelling as well as soothe pain. If you’d like to be a little more dignified about it, make a plantain poultice or prepare some plantain salve in advance and keep it handy for when the need arises (see directions here). Combine 1/8 cup of water and 1/2 a cup of fresh plantain in a blender. Pulse until the mixture looks gloopy. The mixture should be moist but overly watery. It needs to hold together and not run all over the place. hold together If it is too watery, add more plantain. If it is not moist enough, add more water. Apply the mixture to the bite so the affected area is generously covered. Keep in place with a bandage. Plantain can be left on for many hours and is generally considered safe for all ages. Calendula Salve is simple to prepare, but needs to be done so in advance of receiving any bites or stings. Calendula contains soothing properties that will aid in healing most bug bites. It also has a myriad of other uses and is an excellent addition to any natural first aid kit. To learn how to prepare your own Calendula salve and read more about it’s uses, see this post: How to make Calendula Salve and why you should. For a small sting or bite, slice an onion and rub the juicy side over the affected area. 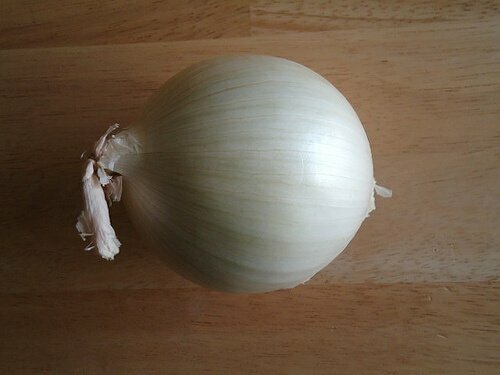 For a more serious or painful bite, tape a piece of onion over the area and leave (can stay on for a few hours). Onion can reduce the pain and swelling of bites and stings from insects such as wasps, bees, ants, spiders, and mosquitoes. To reduce the itching and swelling form bug bites, slice a garlic clove and rub the affected area with the juicy side. Garlic can sting, so be very careful when using this method to treat bug bites. I suggest using on adults and not children (at least to begin with) and only rub the garlic clove over the bite a few times. If the bite is large, you might consider using a garlic poultice instead. Isn’t it wonderful that we can use God’s creation to treat and heal out wounds? It never ceases to amaze me! I hope you find these home remedies effective this summer. What are your favorite natural methods for treating bug bites or stings? Next Post: If Motherhood Isn’t a Competitive Sport, Then Why Do We Beat Ourselves Up? For mosquito bites on my boys, I’ve been using lavender oil. It’s working pretty well. Thanks for posting the information on homemade bug spray! I am going to give this a try. I have been using a commercial natural bug spray for my girls, but my oldest is still getting eaten alive. I was just about to throw in the towel and get some deet bug spray, but I will try these options first. Thanks! We have used teo tree oil for several years on bug bites. If used within a few minutes the bites will disappear and not leave a mark on the skin. It does take a few minutes for the itching to stop. But it works wonderfully. Tea Tree oil can be used for lots of skin issues. It is a must in our medicine cabinet! I second the use of lavender oil applied right on the bites. I also find applying lavender oil on pulse points and ankles helps to deter the mosquitoes in the first place. I’ve used lavender essential oil too. Thanks for all these great ideas…I had no idea onion would help! Seems like onion and garlic are good for everything! O Lordy Lord, yea except for eating! What great tips, Stacy! I got some mosquito bites the other night, so I need to use some of these. 😉 I bought the stuff to make my own repellent this year, but I haven’t done it yet! Last year we used the CJ’s Butter brand, and it worked great (and had no toxins!). I tried witchhazel on a mosquito bite and it worked wonders! I put it on before bed and the itch, sting and swelling were gone by morning. This is a great idea. I’m adding to my list of go-tos. I forgot about witch hazel! I never knew about onion and garlic! (Sounds like the beginning of dinner to me :)). We currently use Graham Garden’s Bug Bar and if we do get a bite, we use their Creature Comfort to soothe it – works wonders! rub rosemary on your skin for a natural repellant. Don’t know the recipe, but a neighbor of ours when we were growing up made chickweed ointment. It was green and greasy but was amazing for mosquito and chigger bites. Wish I could find a recipe for it-was the best thing I ever had for them. I was recently stung by a hornet. I put a fresh plantain poultice on it right away. It took the pain away and kept it from swelling. Ah, sweet relief! Glad to hear that. It’s always nice to see these herbal treatments in action. I am so impressed! I would like to make some natural bug spray soon. I tried the onion today and it really worked. My son was super itchy and the onion worked on some areas. When he kept complaining I taped an onion slice to his back and it stopped the itch. That’s great! So glad the onion helped. A paste of baking soda and water will take the sting out of mosquito bites, too. Thanks for the other tips–always good to know! Great idea, Diana. I hadn’t thought of that! Thanks for sharing. Would you put me on your mailing list? Just what I needed to know, thank you!! Love the ideas! Wanted to let you know I linked it up for my Weekend Wanderings post. I get bit by just going outside. I will try this now on the bites I have.